Green onions, also referred to as scallions, are used in a vast array of recipes to add flavor, color and pop in many dishes today. While this is the case, a considerable number of people today are still confused about the part of this ingredient to use for which meal and how to chop it. If you are confused about the part of green onion to use and how to cut it, you are not alone. Depending on the part of green onions you would like to use, there are several ways you can cut and slice it. For instance, thin circles of the green ends of scallions are known to be great for garnishing dishes. Thinly slivered scallions that have be sliced lengthwise, on the other hand are great for soups and ramen. 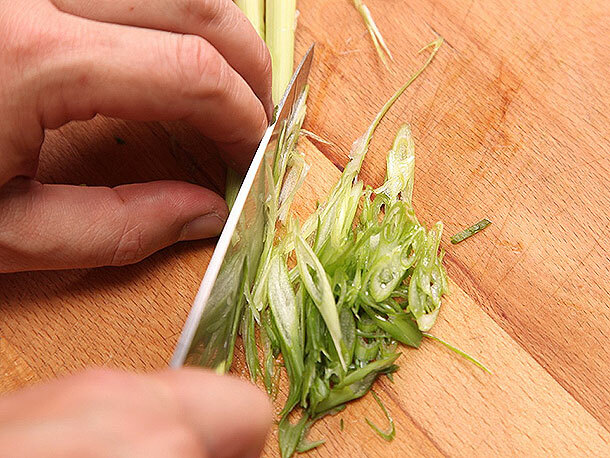 Depending on what you are preparing, the right way of cutting green onions will vary. 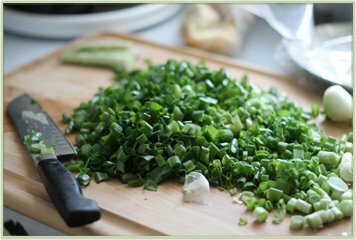 Discussed below are the 3 main ways of cutting green onions you can use today. Select the tender and small scallions (about 3 to 4 green onions should be enough). The selected green onions should be the ones that are still firm and have thin stalks. Rinse the selected green onions and place them on a chopping board. To avoid crushing the onions as you cut, it is advisable to work on smaller batches at a time—especially when you would like to prepare a large number of them. Again, you should not stack the onions on the cutting board because this will cause you to crush them as you cut. You may need to place the cutting board on a kitchen board to prevent it from sliding as you chop the onions. Having done that, you should cut off about 2 inches of the green tops and the root ends and discard them. Using this knife, you should cut off another 1/8 inch to ¼ inch above the root end and the top of the green hollow ends. The thin scallion slices may be used for garnishes and the thicker ones for recipes that require you to actually cook the green onions, such as baked eggs. Leftovers should be stored in a refrigerator to prevent them from going bad. When sliced scallions are stored in a refrigerator, they tend to become limp as time goes by. To revive such onions, you should soak them in ice-cold water for about 30 minutes before using them. To begin with, you should cut off the hollow ends and roots of the green onions you would like to chop. Using a sharp knife, you are supposed to cut off and discard about 1/8 to ¼ inches of the root end. From the hollow tips, you are supposed to cut off and discard about 2 inches. While doing this, you should avoid cutting the dark green ends of the scallion. These need to be chopped into finer sections. Though not necessary, cuts made at about a 45-degree angle will give you a more unique look. Such a cut should result in diagonally-sliced sections. Rinse and lay about 3 to 3 scallions in one layer on a cutting board in such a way that they lie next to each other. You should avoid stacking the onions as this will cause them to crush as you cut. As usual, cut off and discard about 2 inches of the green tops or save them for other applications. Use your non-dominant hand to hold the onions in place and the other one to hold the knife parallel to the onions. 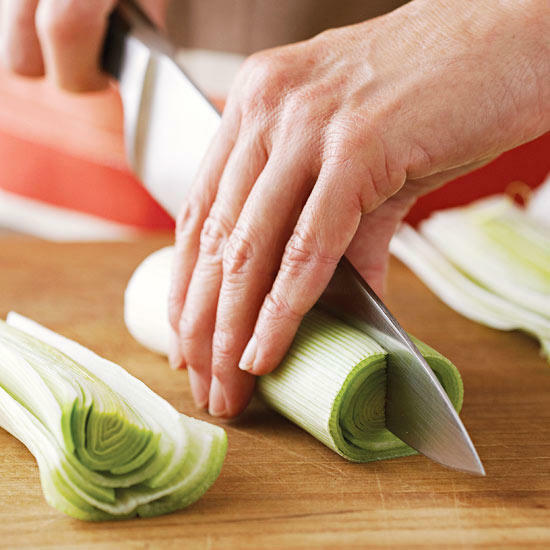 By holding the knife parallel to the onions, you will be able to make longer and thin strips of the green onions. 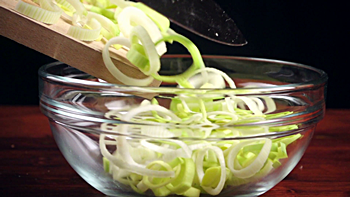 To cut the onions, you should slide the knife across—by pulling the knife toward you. Now soak the longitudinal scallion sections into ice-cold water for about 30 minutes. You may as well place the soaked onions into the refrigerator to enhance the absorption of water by the onion strips. Whether it is for garnishing food or cooking applications, the way you cut your green onions can make a great difference. Depending on the particular recipe you are preparing, you need to ensure that you cut the onion correctly. As you have learned throughout this guide, there are several ways of cutting scallions, and their suitability will depend on the intended application. However, cutting these onions is not rocket science—provided you follow the above described procedures, you should get what you want.